Our select group of therapists utilize play therapy to help children express what is troubling them when they do not have the verbal language to express their thoughts and feelings (Gil, 1991). In play therapy, toys are like the child's words and play is the child's language (Landreth, 2002). Live! exercises utmost ethical practice to give you and your family evidenced-based treatments designed to meet your needs. Play therapy is the systematic use of a theoretical model to establish an interpersonal process wherein trained play therapists use the therapeutic powers of play to help clients prevent or resolve psychosocial difficulties and achieve optimal growth and development (APT, 2015). Easy-to-use client portal to cancel, delete, add change appointments as well as update information and communicate securely. If you are looking for an intense intervention with quick results, this may be the route for you. Call for rates. Live! offers solid supervision to Social Workers and Play Therapists. Call for rates. Clinicians at Live! work closely with lawyers, financial professionals, and other clinicians to help divorcing couples work collaboratively, focusing on the needs of the children. 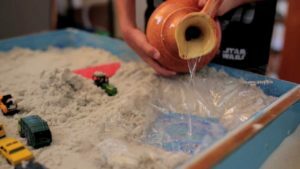 Sand tray therapy is often used with children, but can be applied to adults, teens, couples, families, and groups as well. Sand tray therapy allows a person to construct his or her own microcosm using miniature toys and colored sand. The scene created acts as a reflection of the person’s own life and allows him or her the opportunity to resolve conflicts, remove obstacles, and gain acceptance of self. OUR TEAM IS GROWING! Please welcome our newest member of the team, Katherine Paras. We’ve worked with some awesome clients who love us and play therapy. Check what the experts have to say about play.